On Friday, I wrote about the 1992 MLB Expansion Draft with the Rockies and Marlins. You can read that here. Today, we are tackling the 1997 draft—the last baseball expansion draft to date. Major League Baseball has gone the longest without one: NFL in 2002 (Texans), NBA in 2004 (Bobcats), and the NHL earlier this week. Most people saw the 1993 expansion as a success. The Rockies and Marlins were competitive, finishing with at least 80 wins in 1996 and 1997. More importantly to the other owners, both teams had great early attendance numbers—especially the Rockies. Phoenix and Tampa were seen as the heavy favorites to land a team when MLB asked groups to submit their bids in 1994. On March 9, 1995, with MLB still on strike, the two cities were indeed selected over Orlando and Northern Virginia. 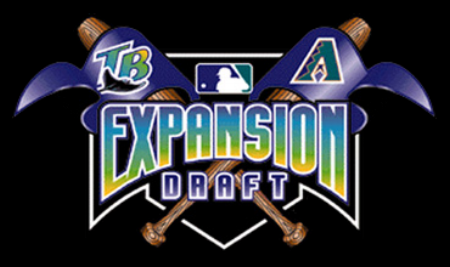 The new cities would start play in 1998, so the expansion draft was scheduled for November 1997. The Devil Rays general manager was Chuck LaMar, hired over from the Braves. The Diamondbacks general manager was Joe Garagiola Jr., son of baseball legend Joe Garagiola. The rules for the 1997 draft were the same as 1992: teams could protect 15 players from their whole roster, players from the previous two amateur drafts were exempt, and free agents were free for any team to sign (but not draft). The Devil Rays first pick came off the Marlins, left-handed starter Tony Saunders. Saunders' career was brief; you probably know him best from this horrific injury in 1999. Brian Anderson gave up 39 homers in 208 innings for the Diamondbacks in 1998, but went on to have a decent career, even starting a game in the 2001 World Series. Jeff Suppan and Bobby Abreu were great picks, but the Diamondbacks and Rays quickly let them go to the Royals and Phillies, respectively. Dimitri Young was also selected and then traded away, this time to the Reds. Tony Batista would eventually be a two-time All-Star, neither time for the Diamondbacks. He, along with Young and Abreu, are the only three All-Stars from the first round. If you remember, six of the first 26 picks in 1992 were All-Stars. Teams must have figured out how to protect their good players because this is weak. The only All-Star from round two was Damian Miller. That's really all I have to say. Now we're talking. Randy Winn and Joe Randa turned into decent players. On draft day, Randa was traded by the Diamondbacks for Travis Fryman. Fryman was traded a month later for 32-year-old third baseman Matt Williams. Williams was with the club for six years, compiling 99 home runs and 381 RBI (142 in 1999). Winn racked up 1,700 hits over 13 MLB seasons; he is the only All-Star from round three. After four seasons with the Rays, he was traded to Seattle for manager Lou Pinella. Brooks Kieschnick was drafted here as a position player, but wound up pitching for the Brewers in the early 2000s. For his career, he had 16 home runs and 96 IP (4.59 ERA). So, who won this draft? Unlike 1992, there's really no debate. The Diamondbacks won 100 games in their second year and a World Series by their fourth. The Devil Rays, meanwhile, lost 90 games or more in each of their first 10 seasons. How did the Diamondbacks build a 100-win team one year after an expansion draft? I'll explore that question in a post later this week. Baseball Prospectus aparently existed in 1997 and has write-ups breaking down the draft for each team. Click here for the Rays and here for the Diamondbacks.